A while ago an epic piece of theatre toured Wales north to south. It had music, family conflict, church versus chapel, and a dramatic centrepiece in the sinking of the Arandora Star. “Cafe Cariad” came with two authors, Greg Cullen's a name who had done long service via Theatr Powys. The name of the other author was a new one at the time. The cast of 50-plus also had many a name who have gone on to make their mark. I asked one of them later how the experience had been. The response ran “Tim? He's really funny.” That was funny as in funny comedic, rather than funny peculiar. So eleven years on, Chippy Lane to its credit presents the mature 38-year old. He has the collected plays in print, has done the South Bank and the Royal Court- for what it's worth, one of my top favourites of the last decade. Parent, Liverpudlian resident, occasional lecturer and award-winner the authorial voice speaks here for near on an hour. The Pricean voice is judicious and considered, magisterial, and to be taken seriously. Not quite. 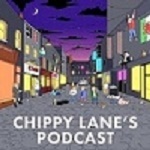 Chippy Lane gives us a torrent of words, colloquial and direct, in free flow and direct. But the spirit should not be misread for a lack of seriousness. These three voices are to be taken seriously. Old themes are revisited. “What we lack is a critical community.” The G40 wrote because, he says, the makers of theatre are obliged to be the critical voice as well. He knows Scotland well from the time of “I'm with the Band.” The Scottish National Theatre was established by its government to make Scottish theatre independent of England. It has toured the world.(31:00.) The government of Wales, via its intermediaries, thinks and does otherwise. There is natural pride to be had in Dirty Protest. The discussion turns again to the theme that has prickled for years. No infrastructure for writers. Not a literary manager to be seen. The greatest schooling ground of actors anywhere in the world is bereft of the writers to turn that power into culture. Theatre should be capitalising on its star power. It has happened once with Michael Sheen. Iwan Rheon is pulling them in this season in St Martin's Lane. But he is performing in that thing of suspicion, a drama. Pembrokeshire gets a walkabout wearing headphones. This is the most cursory of critical skips across fifty minutes. The talk kicks off modestly with “I hope it isn't boring.” There is whiskey in the background- the “e” denotes it is not Scotch. It is conversation, not a lecture. Items of memory are thrown in. “I went to youth theatre for £1 a week” says Katie Elin-Salt. It has peals of laughter to it. That Elin-Salt voice is inimitable. If Jordan Bernarde is the quieter presence between two exuberant personalities that is no discredit. Harpo kept quiet while Chico and Groucho joshed. A debate is in being. For England it was last week's news. The Guardian has done its bit. Front Row pitched in, its manner gentle with no research done. The Arts Council- “nothing to do with us, gov”- and the Board may take comfort in this. But national institutions do not exist for the pleasing of other places. Chippy Lane has set the ball rolling. The many non-artists who stack the committees would be recommended to listen to this. It is the spirit that you have turned your back upon. Postscript: listening a second time the recording was made presciently on 18th May. The critique, that includes the diversion of funds outside theatre and the aversion to drama, occurs at 12:00 to 16:00 minutes. The tribute to Wales' writing company begins at 19:10 and is told with much comedy. Jordan Bernarde lists the actors who were his school contemporaries at 36:00. The conversation asks for the same encouragement to be given to writers as is given to actors.